Sound Devices 744T Portable digital audio recorder, four-channel analog and digital I/O, 24 e 16 bit, 192 KHz, CF slot, with 250GB internal Hard Drive, includes 4500 mAH Lion battery, AC power/adapter. 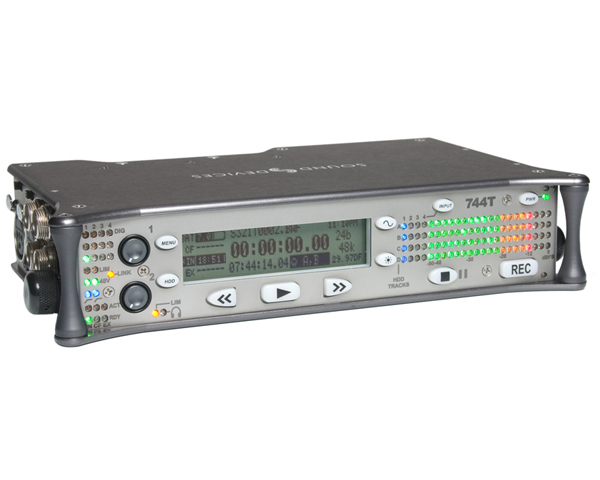 The Sound Devices 744T is a powerful four-track file-based digital audio recorder. The super-compact 744T records and plays back audio to and from its internal hard drive or Compact Flash medium, making field recording simple and fast. It writes and reads uncompressed PCM audio at 16 or 24 bits with sample rates between 32 kHz and 192 kHz. Compressed (MP3) audio playback and recording from 64 kb/s to 320 kb/s are also supported. The time code implementation makes the 744T ready for any recording job—from over-the-shoulder to cart-based production.